First minted in 1982, the Chinese Panda Gold Bullion Coin was greeted with great interest among collectors. This interest peaked in 1987 after which lower mint figures resulted in limited availability. 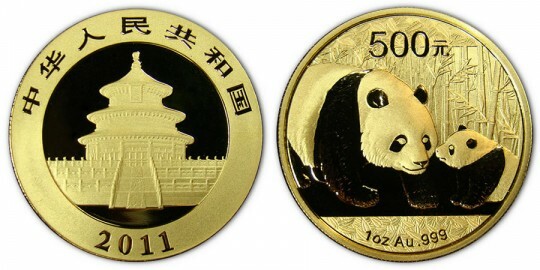 Each year (with the exception of 2002), a new design is featured on the reverse of the Panda coin. The annual changes have helped their popularity and have kept demand steady. Additionally, this also allows the Panda coins to generally receive a slightly higher premium than others sought after more for their intrinsic values. The coin is available in five sizes: 1 ounce, 1/2 ounce, 1/4 ounce , 1/10 ounce and 1/20 ounce -- the last beginning in 1983. The face value of the coins have changed through the years. From their launch to 2000, they were denominated in 100, 50, 25, 10 and 5 Yuan. Since, the symbolic values have changed to 500, 200, 100, 50 and 20 Yuan. Minting techniques have improved over the years, and the famous colors of the panda (black and white) now appear more realistic than ever. They accomplish this by faking the eye with reflections. Mirror-like finishes reflect more light, giving a golden white hue, while duller finishes absorb more of the light, presenting a darker appearance. Differing finishes have been available through the years,with collector proof, brilliant uncirculated and limited editions also minted. There were even 5 and 12 ounce versions minted for some years. Depending on when minted, the coins may bear a "S" mintmark for the Shanghai Mint or the "Y" mintmark for the Shenyang Mint. Not all years have a mintmark. Also very popular is the Chinese Panda Silver Bullion Coin. The obverse design shows the Temple of Heaven in Beijing and the year. The 2011 Panda Bullion coin reverse shows an image of an adult panda and one of its cubs. Also shown is the face value of the coin, the size, the periodic symbol for gold "Au", and ".999" for the purity.